The Phosban Reactor 150™ has become a staple amongst most aquarists who keep SPS corals. So much so that you often see Phosban used interchangeably with the term GFO or Granular Ferric Oxide. Includes ball valve for regulating flow, and flexible connection fittings that rotate 180 degrees to allow a perfect custom fit to your installation. The threaded lid design makes servicing quick and easy. 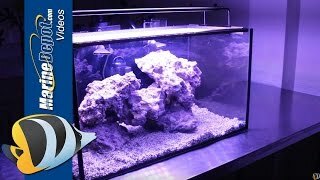 One reactor for aquariums up to 150 gallons. cheap rubber elbows scare me as a leak could occur. But it is easily mitigated. My phospates came down quickly and my corals look better than ever! Very economical and wonderfully priced! I"m glad I bought it! The Best for the price!!! Best little reactor for the price. I have three of this product and have found it to be excellent. The people at the company have been very helpful in getting me replacement parts, etc. Works great. Only been running for 3 days and brought my phosphate level down from 0.07 to 0.00! Excellent value for the money.